I have a very soft spot for colour. In fact, it is probably the most important part of any design to me. There is a definite magic to colour…. The stories behind various colours are also amazing. They are soaked in history and play as important a part as any spice in world history. 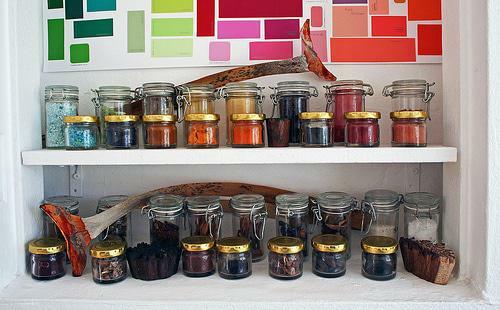 The stand was hosted by an Indian company that specializes in natural dyes. When I asked them about this they brought out a tray of about 30 different natural dye powders, barks and other substances. I was entranced. 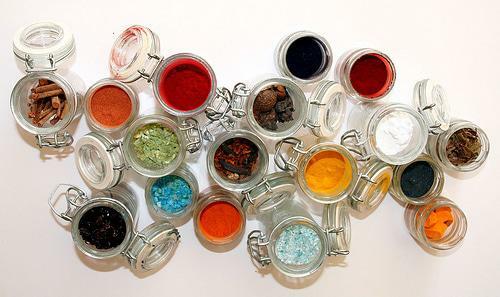 I managed to get a small amount of each ‘colour’ and now boast a small collection of natural dye stuffs. Unfortunately they did not speak English so communication was virtually impossible and I have no idea what colour the dyes produce, or what is a dye or fixative for that matter. I did experiment a little bit with them and discovered some amazing things – for example, one that looked like it should turn the fabric red, turned it purple…and when the fabric was dry it turned green! Magic! I even found that one tub was pure indigo….my favourite natural dye colour!!! Unfortunately I could not find the fixative for the indigo so it ran and both my dogs and I turned blue for a good few days! I am smitten with this collection and it is now my biggest dream and goal to learn about natural dye stuffs and how to dye with them. I want to go to India and learn this skill because to me, natural dye has a magical beauty! This entry was posted in Blog and tagged Colour, Dye Stuff, fabric dye, India, Indigo, Natural colour, Natural Dyes. oooh, your dyes look lovely and it sounds like a very interesting process! Great post,Wendren! Yes, I like the magic of coloures too!Very interesting to read and nice choice of pictures! I hope you got AnneÂ´s mail yesterday? Have a nice day! That is soo cool. Hopefully you will be able to go to India one day. I wonder if you could go on some sort of apprenticeship trip â€“ I bet you could get a grant for it. I love the look of this dye collection and the way you have organized your colours. What an amazing collection! It’s like the beginnings of a color laboratory.